Some places are magical because they are stunningly beautiful. Some places are magical because they are open-air museums, a snapshot into history. Some places scream culture, arts, and nightlife. Some places have the best food, live music, or endless theatre. And then there is Bali. I’ve been very blessed to travel to a lot of places in my life, and while Bali isn’t the most visually beautiful, it is, perhaps the most energetically powerful. The island of Bali has a spirit all its own, and it is palpable. The island isn’t big, per se, but it isn’t small either. At 95 miles wide and 69 miles long, the island is packed full of amazing temples, colorful traditions, and beautiful people. There is a stillness to the air, a sense of peace, and tranquility that also seems equally alive at the same time. I remember one of my last mornings on the North Shore. I woke up early, around 5 am. Something in the air was calling me towards the water. I walked down to the beach on the Bali Sea, and I took in the smell of sage in the air and listened to the chants from the nearby village and temples. The sky was the most vibrant color of purple, no filter required and I’ve never seen any body of water that calm and still. The fishermen were gliding past me, and I felt the highest sense of peace and belonging in perhaps my entire life. They cast their nets into the still water, and I wondered at the simplicity and beauty of it all. Since arriving on the small island of Bali, ten days earlier, I’d never felt more aware, more content, more at ease. There is magnetic energy in the air that is unmistakable, and the people of Bali seem effortless and genuinely happy. They don’t have the financial means that most western cultures enjoy, but their happiness seems ten-fold. They embrace family, they forgive, focus on joy, and honor nature and its innate and compelling beauty. Harming another human in word or deed goes against their very core, and they take time in each day to honor their elders and their ancestors that came before. The simplicity of Bali took hold of my soul during that morning and throughout my three weeks learning and growing from this fantastic island. I found myself asking…how many choices do we make daily that ultimately make us miserable, and for what gain? A busy schedule full of pleasing others? When will we value the simple things and find the happiness and peace that the Balinese people enjoy? It sounds like an unrealistic dream for many, but after immersing myself in such a fantastic spot, I feel like it comes down to simple small decisions we make day after day. There were specific experiences during our stay that drove the message home again and again. Moments that stood out for me and imprinted Bali in my heart for a lifetime. One of these experiences happened when we awoke at 2:30 am to hike to the top of a local volcano, Mt. Batur, to watch the glorious sunrise from a spectacular vantage point. As the sun rose over nearby islands and volcanoes, I watched as people became visibly moved to tears. A chance to feel so small and insignificant, so alive, so free and so in control, yet out of control at the same time. Equally touching was the chance to walk the local markets and take in the vibrant hues, the unique smells, the smiles of the Balinese women and men working their stands, and the pure joy and simplicity housed within their collective smiles. Poverty, a genuine part of their existence, yet, happiness lives there with them too, in equal space, because while they may be monetarily poor by western standards, they are deeply rich in all the things we should value the most, family, friends, laughter and love. Perhaps the highlight of the entire trip for me was a visit to the Tirta Empul (Healing Waters) temple. We were traveling with and hosted a group of grieving people during our stay in Bali. These people were mourning various things from the life of those they love, the loss of a marriage, and in some cases, merely the loss of themselves. 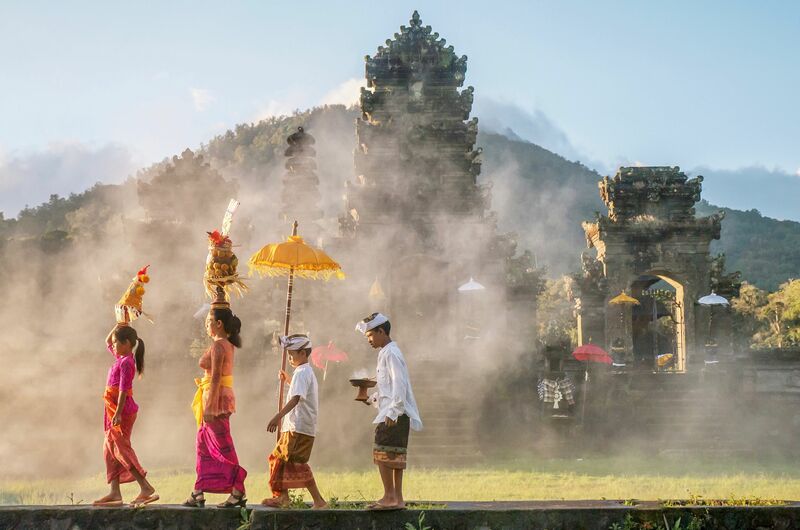 This unique temple was constructed in 926 A.D. and is considered by many to be one of the top holy sites in Bali. The inner courtyard of the temple houses 15 fountains that flow from the fresh spring. Each sacred fountain has a deep and significant meaning, and for those who wish to participate, you enter the water and allow the fountains to wash over you. Many of our guests, myself included, left in tears that were cathartic and cleansing, many of us feeling a release of old pain, trauma, and anger. My time in Indonesia was life-changing, and it will be one of those place on earth that I return to again and again. I learned so much; I grew, I morphed into a higher version of myself, and isn’t that what life and travel are meant to do? Coming home after our adventure was challenging for me and for many others who had joined us. Suddenly the stark contrast of our cultures was glaring, and even though I feel as if I have a higher understanding of life that comes from being widowed at the age of 36, that understanding grew 10-fold in Bali. The hustle and bustle of a busy western life was a stark juxtaposition to the ease of joy found in Bali. So I will share with you the top 10 things I learned from my time with the Balinese people with hopes that you can incorporate some of into your life now. These are little Balanise nuggets of knowledge that will elevate all that you are. #1 – Love everyone and everything. We are all connected. #2 – Be grateful for your smallest blessings. #3 – Do everything with joy and love. #4 – Work hard and don’t complain. #5 – Respect your elders. #7 – Cherish nature, it’s our greatest gift. #8 – Forgive. Holding onto anger only hurts you. #9 – Let go of things you can’t control. #10 – Honor the dead by remembering their lives and all they gave to us. I hope everyone has a chance to experience this special place, not for the fancy resorts or the trendy travel opportunity, but for the personal growth, enlightenment, and peace they will discover. Bali has so much to teach us if we are open to stepping back and seeing life from a new, simpler place. We loved Bali so much we are going back in January 2020 with a new group of adventurers. We will be experiences the holy waters, the markets, the volcano and we have a few new surprises up our sleeves this time around.